Young Sam wants to go to knight school, and Sir Simpleton is the king's designated knight trainer. Sir Simpleton claims the right credentials. "Professional Dragon Tamer, Sword Fighter, World Explorer"
But when Sam shows up for his first lesson, he can't help questioning Sir Simpleton's follow-through on his own dictums. Sir Simpleton insists that Sam's armor must be shining, but the actual suit of armor he offers is rusty and tarnished. He recommends a sturdy charger as Sam's mount, but returns leading a swaybacked donkey. Rescuing a princess in peril turns out to be a do-it-yourself operation for Sam and for the princess, who bravely swings down from her tower on her own rope. When Sir Simpleton recommends consulting a magical wizard, he provides a bearded goat. Always be sure the drawbridge is down! 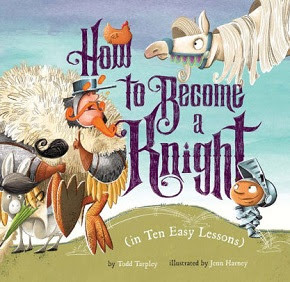 It's a medieval mess, in Todd Tarpley's How-To How to Become a Knight (in Ten Easy Lessons) (Sterling, 2018), as Sam perseveres toward knighthood. Artist Jen Horney is in on the joke, with flamboyant illustrations of Sir Simpleton's absurd recommendations and Sam's successful efforts to school himself as a knight that provide much of the humor in this fanciful Hard Day's Knight.